I was sucked in almost immediately. Blizzard had created an online game that was so complete, so rich, and so polished that I found I could spend hours upon hours in it without even thinking. The game itself likely needs no description, as it has been the world's most popular video game of the past decade. The first character I made was one of the tribal bull-people, a Tauren shaman, named Ituahn. Ituahn would always hold a special place in my heart as my original World of Warcraft character, but I never actually started playing the game, in it's entirety, until I made Dloin, the dwarf warrior-pirate, that I had played on Everquest. Dloin adventured alongside my friend's dwarf paladin, Forri, and of course, me being the budding writer I was, I knew their entire history was intertwined since it started back on Everquest. We fought our way up the levels together on the server Silverhand. I would role-play any opportunity I got, while he would do so often only when I was around, and then to a much smaller degree. I created a guild, The Pirates of Khaz Modan, and began recruiting other players who saw the game much the same way I did; as nothing more than an online community where you could log on, adventure and have fun. Other guilds wanted to push themselves to be the best raiders, or the best at player-versus-player combat. Others took their role-playing very seriously, with rich and deeply woven guild storylines. The Pirates? We were just pirates, and we enjoyed ourselves. By the time The Burning Crusade released, the PoKM grew swiftly in size, reaching over 200 members on Silverhand, often with around 25 or 30 active at any one time. This was far more of an achievement in my mind than getting promoted at my real-life job of Target. Sure, at Target, I was in charge of the electronics section of the store, the one who was there almost every day of the week and who the store leaders looked to for information, news and feedback. But in Azeroth, I was leading a crew of over 200 pirates, all of whom were lively, energetic, and looked forward to playing with each other and with me. After my friend, who played Forri, quit the game, I hired a new first mate, and it was through her that I learned exactly what being a guild leader meant. She helped me see that I was in fact someone the guild looked up to and was excited about (she often said that our guild chat channel would be dead silent until I logged on, even if there were 20 players online). She helped me organize events for the guild, with in-game prizes. Even though most of the activity was limited to a select few members (often the same dozen out of 200), it was still fun and exciting to play with these people, and any time I stepped back and realized that I was the leader of their organization, it was literally unbelievable. And then, I quit. But not all at once. Rather, it was a slow descent from my once grand activity. As with most aspects of my life (especially at that time), I tended to wander. The longer and more effort I put into something, the harder I would fall from it later. This was while The Burning Crusade was still the latest content, and it was still a time when admitting you played World of Warcraft was a social stigma. Embarassment, a desire to do more with my life, and a desire to grow up, all grasped me almost at the same time, and I slowly faded from my guild and from Silverhand and World of Warcraft as a whole. When the next expansion, Wrath of the Lich King, was released in 2008, I paid little heed to the game any more, except for the occasional nostalgic pangs I would get over my guild. When I decided to rejoin the game in 2009, I had come to the decision that I should start from scratch. New character, new server, new focus on the world of the game itself. I recreated Dloin, because I am nothing if not a one-trick-pony, and I did something I had never even thought of doing before; I checked the Blizzard forums, looking for which realm to join. I knew that my primary play-style was still role-playing, but which server would facilitate that the best? A short search later brought me to the server of Moon Guard, and it has been my home ever since. I quickly established a forum presence for myself, as it was a good way for me to be present with the community of the game while I wasn't actually playing the game. I finally owned a cell phone with the capabilities of going online, and while I was still somewhat ashamed of playing the game, much in part because of the people I chose to hang around with at the time, I was only really playing on my own, with the occasional late-night role-play after I was done questing for the day. And then, a number of things happened at once; I discovered the pirate-metal band Alestorm, I saw Pirates of the Caribbean: On Stranger Tides and thought 'that's not a good pirate story', and I finally got up the gumption to own the fact that I was playing World of Warcraft rather than hide it from others. These three ingredients came together, fueled by the presence and popularity I had built for myself on the server's forums, and I eventually created The Pirates of Khaz Modan on Moon Guard. This version of the pirates has been its longest running and its most memorable. While the Silverhand version had many things that still stand out in my mind to this day (random taglines like 'Whales...? ', an amazing core crew who I knew I could always count on, and the original versions of some of my favorite guild events like Prison Break! and Tauren Darts), the Moon Guard version was the one where the guild really came into its own, at least for me. We never reached the numbers we had on Silverhand, but our overall activity and server-wide popularity was exponentially greater, and increasing by the week. People who I never played with before, and who only knew me on the forums, would stop and say hi and chat in the game if they saw me. Others were kind enough to throw gifts my way, making sure my terribly-low-level dwarf pirate captain was properly outfitted with everything he needed. While I don't think I ever had much influence or credibility in the server community, I was at least seen as the guy who would never take the game too seriously, and who would always promote a fun, accessible, and engaging experience rather than push himself and his guild mates to always be at their best. We had events every week, some were open to the public (like drunken Stormwind footraces) and some were guild-only (like Prison Break! or the Trek Across Tanaris). We were at our height at the end of Wrath of the Lich King and the beginning of Cataclysm, and the reinvigorated server activity helped propel us to the greatest number of players we would ever see on Moon Guard, around 120. And then, that same feeling I once had, that strange notion that my life wasn't moving in the proper direction, that I wasn't doing what I should be doing with my time, that I was letting my future slip away while wasting time, found it's way back into my mind. I quit World of Warcraft again, this time disbanding the guild rather than letting it stagnate, and I did some soul-searching. I went back to college, eventually finishing my two year degree and, after bouncing from one career choice to another, landed on the lowest common denominator out of all of my choices, and the one thing I had been doing almost consistently since I was very young, whether it was in an online game or in the real world. I wanted to become a story teller. I was a writer at heart. I knew that now. The biggest shame was that it took me until the end of 2012 to actually realize it, and to do something about it. But I found that missing piece, that calling that I wasn't hearing for so long. I learned that to be who I wanted to be in life, I needed to surround myself with people who would support me, not who would try to mold me into what they wanted to see. And, in 2014, when things were going at their best and I was finally starting to see myself become the person I wanted to be, I put those nostalgic glasses on again and looked back at the game that had become such a large part of my life. World of Warcraft wasn't a shameful thing, as I had been taught to believe for so long. And it wasn't contradictory to my path in life, as I had mistakenly determined some time ago. It was just... itself. It was a game, a world, and best of all, a community, that I knew so well and was such an influential part of my life. Now that I knew where I fit in the real world, I didn't resent the clarity of purpose I had in Azeroth. I rejoined in 2014, and breezed through the content I had missed in Mists of Pandaria, now waiting on the cusp of the next expansion, Warlords of Draenor. Now, I still play it, though not as much as I would like. Adult life has a way of reorganizing priorities. 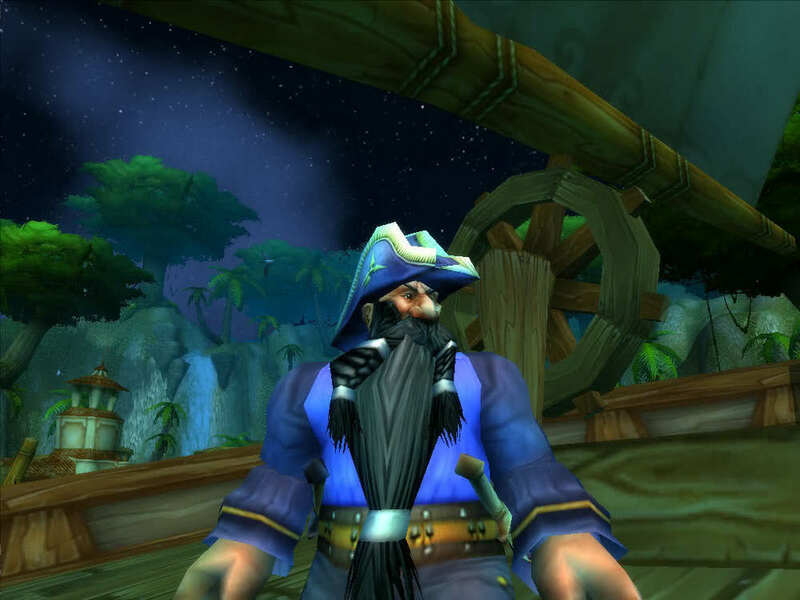 But Dloin still exists in Azeroth, and though he has lost his crew and isn't as prominent of a community figure any longer, he is still wandering the seas. His story continues, and it has been one so influential to me that I knew it was a story I had to tell. And that is what is being adapted and rewritten into the upcoming serial Astral Tides. Want an early look at the upcoming Astral Tides serial? Just subscribe to the mailing list to get your hands on that, and other exclusive, FREE content!